New Slippers. Again for Now. Would U Give Up Ur Seat? What to Do with These Warehouses? Dustin Patrick Runnels, better known as Dustin Rhodes (son of Dusty and half-brother of Cody), debuted in the World Wrestling Federation fifteen years ago and forever changed the face of this sport. Garbed in black and gold, the Hollywood-lovin' and movie quote-spoutin' cross-dresser was a master of mind games. 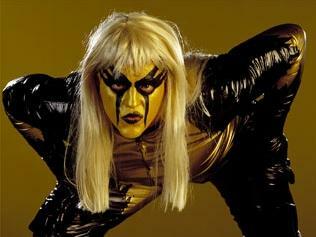 And after you've seen and heard it all, you’ll never forget the name...(*deep inhalation*) Goldust.